Pressure die casting without a melt. In case of a dry shot, the plunger enters the empty goose neck. Despite the same shot valve position, this results in a higher speed than achieved by casting with a melt. Determining the plunger speed vmax at this setting (dry shot speed) is used for machine calibration. When the speed control valve (proportional valve) is fully opened, then the maximum plunger speed vmax is reached. Knowing the plunger surface area A0, the p-Q2 diagram (Fig. 1) and eq. 1 can be used to calculate or determine the maximum volume flow Qmax as the right outmost point of the machine characteristic (i.e. the plunger reaches vmax, the metal pressure being 0). 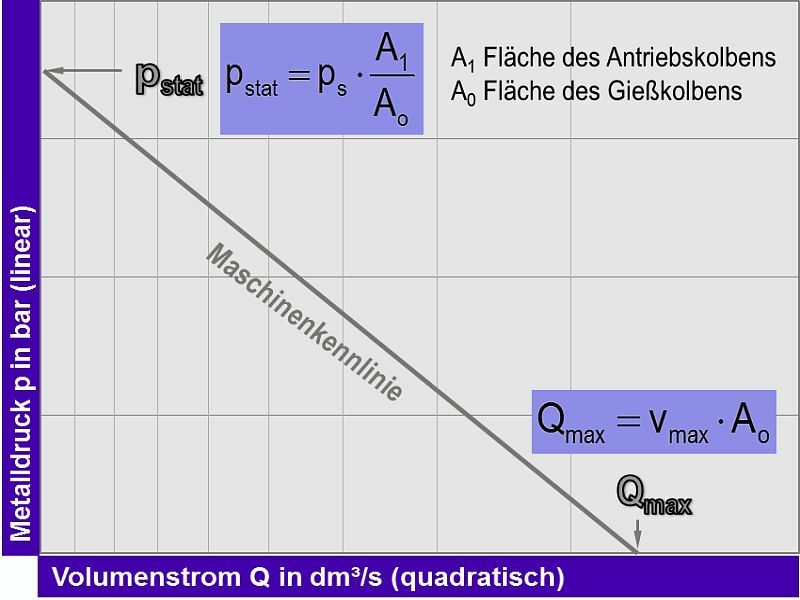 Qmax = maximum volume flow; A0 = plunger surface area; vmax = maximum plunger speedThus, the machine characteristic represents the line connecting the statistic metal pressure upon completed plunger movement with the maximum volume flow, which is the product of the plunger surface area and the plunger speed for the dry shot (without metal). A complete casting cycle applying a dry shot can be referred to as an empty shot, dry shot or zero-load test. Brunhuber E., Praxis der Druckgussfertigung, Schiele & Schön, Berlin.